This closing chapter begins by taking first steps towards an abstracted “background narrative” for Islamic legal-theoretical evolution (Sect. 9.1), describing a matrix of constantly evolving “argumentation epistemes,” the early confluence of which, infused by new Islamic axioms and driven by the exigencies of dialectical disputation, lies behind the development of epistemic justification in Islamic sciences. Following this, a “motive model” is offered to explain how the exigencies of dialectical disputation shape theory-systems at an individual level; dialectical axioms are bequeathed to theory-systems via the anticipation of thesis-destroying critiques (Sect. 9.2). 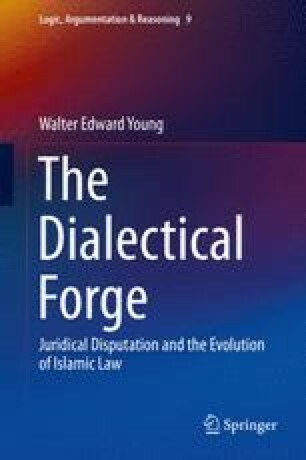 The chapter closes by calling for an increased focus on Islamic dialectics, emphasizing how its study may contribute to disciplines both within and outside of Islamic studies, and to the broader intellectual history of the world (Sect. 9.3).